From the amazing limestone formations to the famous longest navigable underground river to the enchanting lagoons and stunning beaches, Palawan is definitely a paradise on earth. In this article, I would like to share with you some tips, recommendations and guide for a hassle-free vacation in Puerto Princesa and El Nido for you to fully enjoy your stay in the world's top island. 1. As much as possible, book your flight ticket two to five months before your desired date of trip to score much cheaper rates. You may also wait for Piso Fare sale from Cebu Pacific or Air Asia. Both airlines are flying from NAIA (Manila) to Puerto Princesa Airport. 2. If you are availing of regular or discounted rates, booking one-way ticket from different airlines will save you a lot of money. Cost of round trip Cebu Pacific ticket from Manila to Puerto Princesa is Php 3,800.00. Cost of round trip Air Asia ticket from Manila to Puerto Princesa is Php 3,400.00. Cost of Cebu Pacific ticket MNL to PP and Air Asia ticket PP to MNL is Php 2,800.00. 3. Book your accommodation via direct coordination to the hotel/inn or via Agoda.com (for more discounts). If you failed to book in advance, airport tricycle may help you tour the city to look for a cheaper hotel/inn/pension houses in Puerto Princesa. Tricycle cost is Php 100.00. 4. For the Honda Bay Island Hopping Tour, getting a tour agency will cost you Php 1,200.00 each person while DIY (Do-It-Yourself) will cost you Php 1,300.00 for the boat good for 10 persons. Tricycle rental will cost you Php 500.00 with pick up from your hotel to Lourdes Wharf and vice versa. Add additional Php 500.00 to include Iwahig Firefly Watching transportation. Iwahig Firefly watching will cost you Php 600.00 per person. 5. 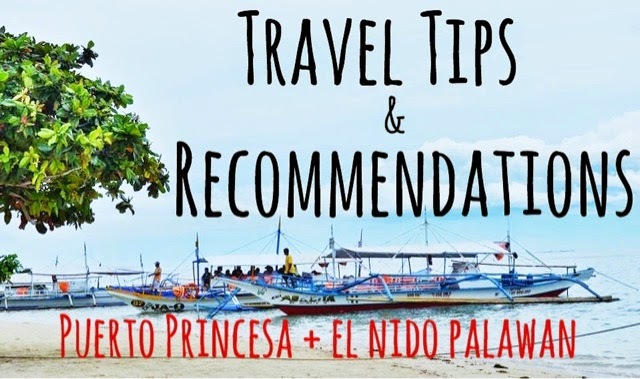 Availing your El Nido Island Hopping Tour and van services from Puerto Princesa to El Nido in one travel agent will give you Php 100.00 to Php 200.00 discount for each island hopping tour. 6. Ka Lui restaurant in Puerto Princesa is open only from 11:00 am to 2:00 pm and 6:00 pm to 10:00 pm. Advance reservation is required due to volume of tourists. 7. You should try eating tamilok (wood worm) and crocodile sisig. These dishes are available at Kinabuchs Grill and Bar, they are open from 6:00 pm to 2:00 am daily. 8. Puerto Princesa City Tour will cost you Php 600.00 to Php 700.00. Each tricycle can accommodate up to 4 persons. 9. Puerto Princesa Underground River tour must be booked in advance via a travel agent to secure permit and schedule. PPUR tour published rate is Php 1,540.00 per person inclusive of transportation, tour guide, entrance fee, environmental fee, boat transfer, wharfage fee and buffet lunch but you can get it at Php 1,240.00 per persons only (see Fort Wally contact details below). This tour includes side trip to Ugong Rock Adventures. 10. Rent a kayak (good for 3 persons) from Php 200.00 to Php 700.00 for El Nido Island Hopping Tour A to fully explore Small and Secret Lagoon. 11. Island Hopping Tours offer free use of snorkeling gears or you may bring your own. Aqua shoes and waterproof bags are a must. Buffet lunch is included in all island hopping tours, they will serve you grilled fish, grilled pork, squid, crabs, vegetables with rice, water and softdrinks. 12. El Nido requires each tourists to pay for Php 200.00 environmental fee valid for 14 days.